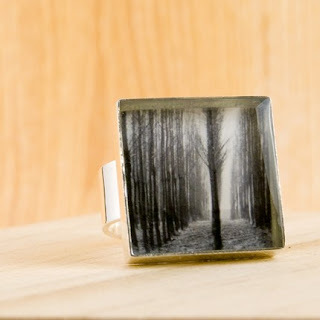 I've met another great artist here in Austin, her name is Jen...and I fell in love with this ring as soon as I saw it. Jen is the owner of Lucy Blue Studio. You all should check out her shop. Most of you know I wear black most of the time, but I also love, love, love black and white photos. Right now, she is offering FREE first class shipping AND - she has a First Monday Sale where she offers 15% discount the first Monday of each month. Have a great day everyone! IT'S FRIDAY!